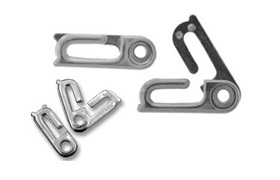 Stainless Steel Sister Hook Clasp, SSSH01, 19/32"x3/16" (15 x 5 mm) has smooth brushed finish. It can be used with any bracelet chains, beaded bracelets or necklaces. Sister Hook Clasp is preferable for the situation when you remove bracelet rarely. This is a very dependable solution by design. It is impossible to open this clasp accidentally. So, you will never lose bracelet with Sister Hook Clasp. To open it when bracelet is on the hand you would need somebody help. To use this clasp you do not need somebody help. For large quantity, please, request a Quote.